In this bizarre short story by Joseph S Le Fanu, a surgeon is transcribing some old accounts from his mentor. The old story within a story. I’m not a fan of this particular device here, it takes some time for things to get going. The mentor is Dr Hesselius, a German doctor visiting London, and his account is the strange case of Reverend Jennings. Jennings is a clergyman who suffers from a mysterious illness every time he gives a sermon in his parish. Hesselius meets Jennings at a get-together and knows a number of odd facts about him just from looking at him, how he learns this is never explained, including the fact that he once loved green tea. Hesselius ends up meeting the man alone another time, but Jennings doesn’t open up to the doctor about his affliction. Later Jennings has another attack while sermonizing, and finally tells the doctor his story. About four years before, Jennings was studying some books on pagan religions and was really into it. He also drank a lot of green tea. Jennings was quite content at this time. Then one night while heading home, he begins to see a spectral monkey with glowing red eyes. From that moment on the monkey follows him around appearing, disappearing, and making a nuisance of himself, but he’s especially agitated when the reverend is praying. For over 3 years this has escalated to the point that the monkey now talks to Jennings, urging him to do evil things. Hesselius is unable to help Jennings *ahem* get this monkey off his back because Jennings kills himself a short time later. So, yeah, the monkey thing is weird. Hesselius thinks it’s because of excessive green tea drinking coupled with a familial tendency to suicide. But why a monkey? Can green tea cause a person to hallucinate a monkey? This modern doctor points out that too much green tea can cause a psychosis. But a monkey? He wasn’t shooting heroin. Hesselius also has a theory that Jennings’s tea drinking may have opened a spiritual door within him that let in an evil entity as the manifestation of a monkey. All those people in the 1960s doing LSD trying to obtain the same thing could have just had a nice spot of tea and some light reading of pagan books. Green Tea reminded me a bit of the movie Monkey Shines, where a helper monkey turns on its disabled owner. 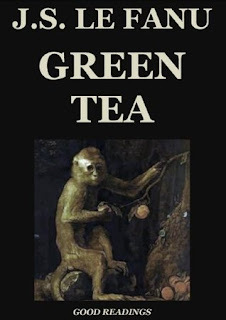 Maybe Green Tea was the beginning of the Evil Monkey trope. The story just adds to my list of reasons I don’t like monkeys, gross little disease spreaders. Is this the same guy who wrote that story abOut the vampiress?